A wordprocessor is a text assembly tool that is oriented towards producing pretty-looking documents, generally on paper. 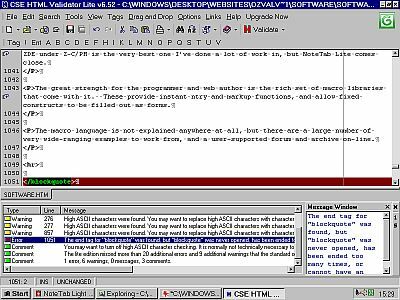 A text editor is also for assembling text, but is primarily oriented towards producing machine-readable scripts and source files like HTML &c. Windows NotePad is an example of a very basic, but still useful, text editor, while WordPad is a basic wordprocessor. While a wordprocessor may have a range of document templates and a wide choice of text fonts and sizes, a text editor may instead have a library of macros and empty constructs specifically suited to writing in various computer languages, and may provide language-specific on-screen highlights. 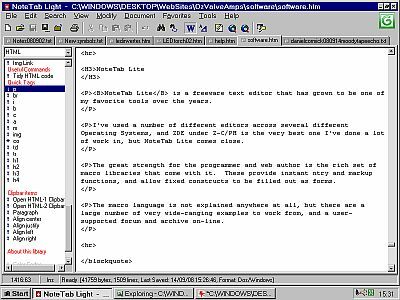 NoteTab Lite is a freeware text editor that has grown to be one of my favorite tools over the years. I've used a number of different editors across several different Operating Systems, and ZDE under Z-C/PM is the very best one I've done a lot of work in, but NoteTab Lite comes close. The great strength for the programmer and web author is the rich set of macro libraries that come with it. These provide instant entry and markup functions, and allow fixed constructs to be filled out as forms. The macro language is not explained anywhere at all, but there are a large number of very wide-ranging examples to work from, and a user-supported forum and archive on-line. Before you take your website magnum opus and just bang it out there, it's a good idea to give it a bit of checking over first. I am constantly amazed at how many web pages have been born “broken”. I tend to dismiss it as my old hardware, but the I get the same results on the modern systems at the library or webshops. There are two sorts of things that commonly go wrong, HTML formatting, and broken links. HTML validation is intended to find mistakes that will tend to limit the number of browsers that will render your page as you intended. This is an off-line validator that operates as a validating text editor. While the free Lite edition says it finds errors only the commercial version will explain I have found that a script that validates to this point generally validates okay in the next step also, W3C validation (below), thus the lite version is generally good enough if you are aiming at HTML 4.01 compatability. W3C are the keepers of the flame. They devise and publish agreed standards for various browsers and web sub-systems to work to for compatability. W3C HTML. They have a couple of on-line validators for HTML and links. Both of these are pretty slow, so some sort of initial off-line pre-validation is a good idea. You can present a page in various ways such as copy/paste, or by URL from your machine or a server. It's pretty strict, and the validate-edit-resubmit loop is pretty slow, but when you get the green thumbs-up and you can add the little tick logo to your page knowing that the vast bulk of web users will now be able to see your pages as you see them. Another major headache are broken Hyperlinks. Most web pages contain links to a bunch of other material, both local and on the web. There are many reasons why these links can be wrong or get broken, so there are a couple of ways to test the links in your script all go somewhere and not the dreaded Error 404 - page not found bit bucket. Again we first check locally, then use an on-line checker for final confirmation. External link checking is a website housekeeping chore that simply has to be done every few months, and there are some tools that automate the process. The tool I have found that does a good job of locally-based link checking is the rather bizzare Xenu(*) with its Greyman-alien icon . A fairly simple tool that does a simple job well - checks all the links on the nominated page for a response, and gives you a dynamic colour-coded report as it happens. For internal links such as photos it picks up common problems like mis-naming or confusion between upper and lower case in filenames, forgetting to actually upload the required photo to the server, or uploading it to the wrong directory/folder. One thing a local link checker can do that a remote one can't is identify orphans, files and images that should be linked but aren't. External links are always changing, and Xenu helpfully follows and records any redirection it finds so you can easily correct your link. It provides an optional report in HTML format, and can provide a list of valid URLs you can submit to a search engine, such as Google Sitemaps. W3C provides an on-line link checker that will validate all the links on a nominated page. It is strongly suggested that you pre-validate as much as possible locally first before using an on-line checker, and that where possible you set a reasonable wait time of 5-10 seconds between fetches. This sort of testing does tend to produce server-clog if you hammer it too hard. Another real freeware user-supported gem. Just about anything you want to do with images, IrfanView will do it. At the basic level of a picture viewer it is very simple and straightforward. And as you want to do things with images, crop them, resize, save as different types, caption, alter the gamma, and so on, you find that these things are fairly easy too. About the only things it won't do is draw on images, lines and pointers for which I use Windows Paint (.BMP format only), and it won't overlay or merge images. One of the few things Irfanview won't do is merge two images. Merge contains tools to move and scale the images until they align, including a neat “drag points together” tool, and lots of rules for combining the images. 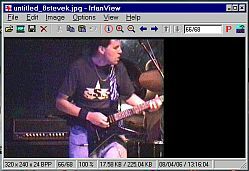 Superimposing pictures is always a fiddly process at best but Merge makes it easier to fiddle. Merge seems to have trouble with images bigger than the screen viewing area - it would be nice to be able to align images at say 4-times size then reduce the merged product, but as you can see above it works well enough to superimpose loadlines on scans of valve characertistics. One thing Irfanview does better is fine rotation of scanned images to bring them into alignment with the frame edges. File Transfer Protocol, or uploading your webpages to your server. 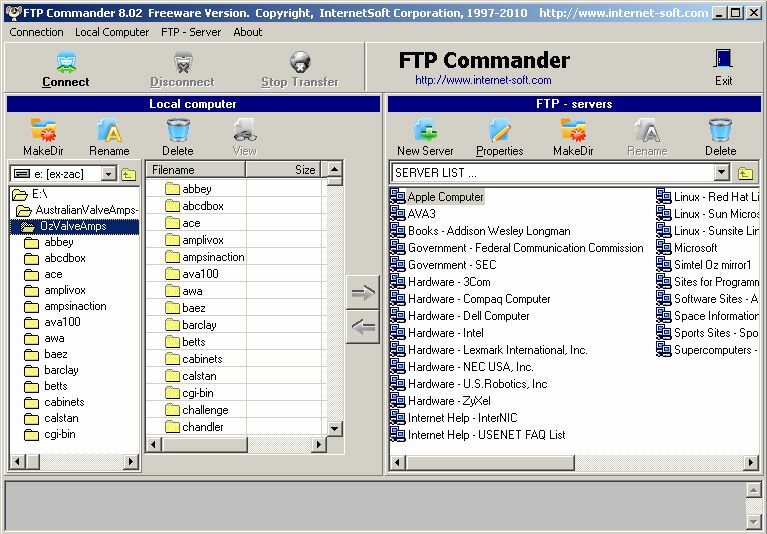 There are several FTP tools in common use. I started using FTP Explorer because it was available and simple. I've tried a few others since but have yet to find a reason to change. As the name suggests this looks and feels a lot like Windows Explorer. To set up an FTP connection to your server account you basically need the URL address of the server, your username, and your password. That's the easy bit and that is all that is typically required. But there are also options available for other modes and operating from behind an unfriendly local firewall. 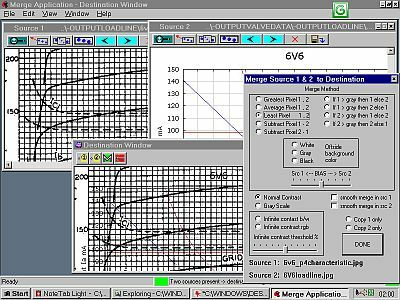 Once you are logged in you are (eventually) presented with the same sort of view as in Windows Explorer, a frame containing the folder tree, and another frame containing the files in the selected folder. 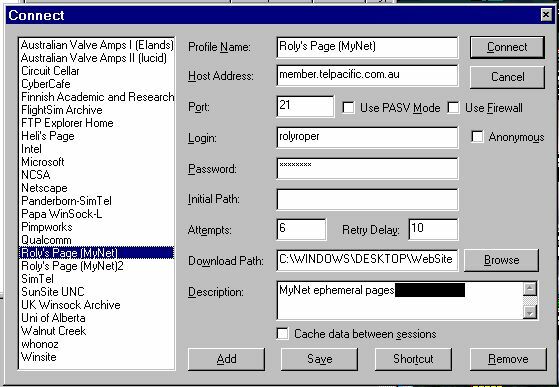 There is a third frame that shows the dialog between FTP Explorer and the server as they chat away doing what you are requesting. While everything is quite a bit slower over the net than handling files on your local hard drive, operations are basically identical; list folder and files, copy, rename, delete, make/delete folders. You generally have Windows Explorer open (but reduced) with the local files of interest, and FTP Explorer alongside (similarly reduced). Files can then be copied back and forth between the systems by dragging and dropping. Updating a website then simply becomes a matter of selecting the locally updated files and dropping them where required on the server tree. Water is wet, rocks are hard, and all software has bugs. These can be cosmetic, only a minor problem, or they can drop you right in it. FTP Explorer does a good job of almost everything from uploading individal files, to creating folders and then filling them; BUT if you take the next step of simply dragging and dropping a folder full of files it will create the folder on the host, copy most of the files, but miss some. In terms of time wasted untangling what it has and hasn't done it could hardly get any worse. This is quite similar to FTP Explorer (above) except that you don't drag and drop, you highlight what you want copied then hit one of the two direction arrows, put or get, between the local and remote file displays. And yes, that icon is a mouse with an eyepatch. WebLooper is a background utility these days known as a download manager, and while it will do some FTP uploads, its strength is in downloading. WebLooper allows you to create and manage a task list of downloads, where from and to. It allows sequential download of files groups with numbers in their names, and it can be configured to pop up whenever you do a “copy shortcut” in your browser. In short, it's a great tool if you want to pillage websites. While the upload side allows the use of a fileslist, it does not allow putting them to different folders on the server, only one folder at a time which is a bit limiting. by Free Software Foundation, Inc and WinWGet Team. GNU Wget is a utility for non-interactive downloading network data. Another pillage tool. Wget is possibly the oldest scripted file downloader. In original form it was purely command-line driven, and you know you've got a powerful tool when there are (by my count) 106 commands and options, and that you don't understand most of them. Originally Wget was equipped to read all the required information for a download from a set of pre-prepared script files, allowing a simple startup command line reference to the required script to start a very major process such as the freshening of a site mirror. Today somebody has written a friendlier Windows front-end, WinWGet, that provides some badly needed padding for the user, but it's still a sports car in that the hard ride gets you somewhere quickly. Wget is intended to get very large amounts of data in the background while you get on with something more useful than watching a thermometer crawl across the screen. Like WebLooper, Wget can be set to trap any URL's that you “Copy Shortcut” on, but it really comes into its own when you want to grab a web page and all its requisites, or even mirror a whole site locally. And like Zip managers it has options to freshen and update mirror images without having to download all the files again. Only the most popular options are directly available in the Wget front-end, but there is a window that allows the inclusion of any Wget option in the documentation.